The Federal Ministry of Education and Research (BMBF) announced the funding programme "Research for Sustainable Development of Megacities of Tomorrow" in February 2004. The "LiWa" project is one of 10 projects which has been approved by BMBF for a five-year period (2008 - 2013). In addition, BMBF approved an extension until May 2014. The project "Sustainable Water and Wastewater Management in Urban Growth Centres Coping with Climate Change - Concepts for Lima Metropolitana (Peru) - (LiWa)" aims at sustainable planning and management of one of the crucial lifelines - water and sanitation. This will be done in one of the urban growth centres of the world, Lima, with particularly adverse boundary conditions. The project draws particular attention to the impacts of climate change on and the promotion of energy efficiency in water and sanitation systems. Research carried out in the project builds upon previous studies and investigations of the consortium partners and, in particular, the results, contacts and intensive forms of cooperation that were accomplished during the successful preparatory phase of the project. The relevant stakeholders have been identified and working relationships have been established. Furthermore, potential technologies of wastewater disposal and treatment have been analysed. 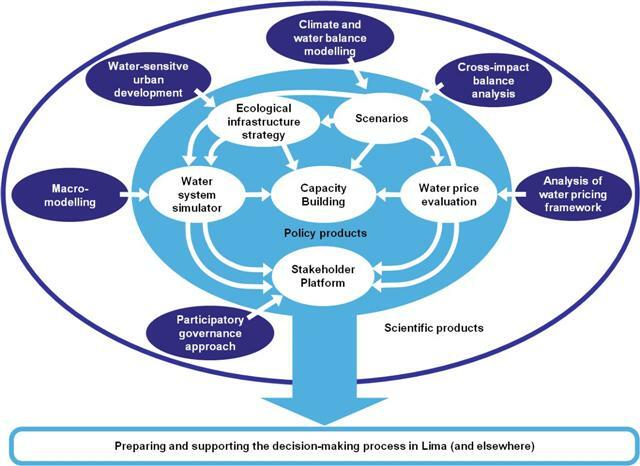 Also, a preliminary version of a macro-modelling tool, simulating water and wastewater fluxes in Lima, facilitating analysis of scenarios and variants, assisting stakeholder discussions and decision making, has been set up. The LiWa project particularly focuses on the development and application of fundamental procedures and tools for participatory decision making, based on informed discussions. 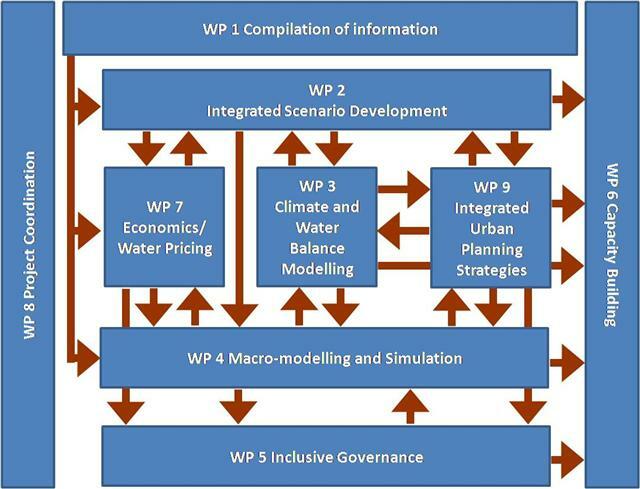 The project builds upon modelling and simulation of the entire water supply and sanitation system within the urban growth centre system of Lima. Furthermore, the project develops and evaluates options for redesigning the water tariff system to meet economic, ecologic and social requirements. With this approach, key issues and challenges of energy and climate-efficient structures of water and wastewater management will be adequately addressed. Due to its importance, not only to Lima, but also globally, the lifeline water is chosen as the focal topic of the LiWa project. Using the example of Lima (a case with particular challenges), methods and tools will be developed to analyse a life-line system. Based on this analysis, strategies and governance proposals will be generated that promise to combat effects of climate change in a sustainable way. The project comprises of (altogether) ten partners, including research and education institutions, the major water utility, NGO partners and SME representatives. The partners complement each other in their expertise in the various aspects of sustainability related to critical infrastructure systems. The project itself focuses on six core aspects, as illustrated in Figure 2. The LiWa project is designed as a seed project, i.e. during course of the project the essential core elements are expected to be extended by additional activities (also by third parties, including industry) outside the project (using third-party funding), but in close collaboration with the LiWa project. Such an approach appears to be prudent due to the dynamic nature of the task and the inherent uncertainty involved in climate change issues. A second feature of the projects underlying philosophy is a two-tier approach: Decision makers and the population are requesting quick measures to be taken, but, at the same time, also the necessity to provide solutions and approaches which are sustainable seen from a long-term perspective. Therefore, a bridge has to be built (and the potential risk is minimised) between the need for successes on a short-term basis (e.g. for attaining public support by politics and by the population of Peru) and the need for truly sustainable long-term concepts. Experiences of the preliminary project phase also confirm the need for neutral yet inclusive advice for strategic decisions to be made for sustainable planning and operation of the water lifeline system. Therefore, the third feature of the project is its reliance on analytical and deliberative processes. The integration of analysis and deliberations ensures that the best scientific knowledge is the guiding principle for designing policies and, at the same time, that technically and economically feasible options are generated and evaluated in a participatory process. The policy products need to be effective, ecologically sound, economically efficient and socially acceptable. In short the policies need to be sustainable. This purpose is also served by the strong emphasis on education and training which assures the continuity of the projects objectives even after the project is completed. The LiWa project is designed to organize an effective and efficient transfer of information between the relevant actors in the area of interests, such as scientists, engineers, water and sanitary experts, decision makers and representatives of the civil society. At the same time, sustaining a continuous flow of information and communication throughout the entire research process constitutes the major innovative aspect of this project, since most communication programs in this field place communication at the end of the process. The emphasis in these conventional programs is on disseminating the result to a wider audience, while this project emphasizes constant feedback and learning among the participants and between the participants and potential users and policy makers. The LiWa project will therefore include a large variety of social actors (government, administration, civil society, private sector and education system) during all crucial stages of the project.